Eric Lamaze and Check Picobello Z. Photos copyright Sportfot. Wellington, FL – February 4, 2016 – Week four of the 2016 Winter Equestrian Festival (WEF) continued on Thursday with a win for Eric Lamaze (CAN) and Check Picobello Z in the $35,000 Ruby et Violette WEF Challenge Cup Round 4. The win marks three in a row for Lamaze in this year’s Ruby et Violette WEF Challenge Cup Series, with victories in weeks two and three aboard Rosana du Park. WEF 4, sponsored by Ariat®, runs February 3-7, 2016, at the Palm Beach International Equestrian Center (PBIEC) in Wellington, FL. The week will feature the Great Charity Challenge presented by Fidelity Investments® on Saturday, February 6. Other highlights include the $35,000 Illustrated Properties 1.45m Classic in the WEF International Ring and the $25,000 Artisan Farms U25 Grand Prix Team Event, presented by the McNerney Family, at The Stadium at PBIEC on Friday; the $35,000 Suncast® 1.50m Championship Jumper Classic on Saturday; and the $216,000 Ariat® Grand Prix CSI 4* at The Stadium at PBIEC on Sunday. Also held on Friday and Saturday at The Stadium at PBIEC is the Asheville Regional Airport Wellington Eventing Showcase, presented by Wellington Equestrian Realty. All of these events will be live streamed at www.COTH.com. The 12-week WEF circuit runs through April 3, offering more than $9 million in prize money. Guilherme Jorge (BRA) is the international course designer for WEF 4 and set the track for 56 entries in Thursday’s Challenge Cup. Fourteen jumped clear in round one, and 12 continued on to the jump-off, where six double clear rounds were completed. Kevin Babington (IRL) and Mark Q set the pace in 42.02 seconds, which eventually placed third. Daniel Bluman (COL) and Conconcreto Believe were next to clear the short course in 42.57 seconds to finish fourth. Lillie Keenan (USA) and Chansonette Farm LLC’s Super Sox were next to go, clear in 41.86 seconds to take over the lead, but eventually finish second. Audrey Coulter (USA) also cleared the jump-off with Copernicus Stables LLC’s Alex, placing sixth overall, with a time of 43.46. Lamaze and Check Picobello Z followed with the winning round in 41.43 seconds, and last to go, Pedro Muylaert (BRA) jumped into fifth with a time of 42.90 seconds riding Rubens Takaneo’s Colorado. Tiffany Foster (CAN) and Brighton, and Todd Minikus (USA) and Babalou 41 were each faster than Lamaze, but incurred faults. Check Picobello Z is a 10-year-old Zangersheide gelding (Cardento x Orlando) that Lamaze purchased from Ilan Ferder when the horse was seven years old. Check Picobello Z is owned by Artisan Farms, LLC & Torrey Pines. The gelding had an injury that kept him from competing at the end of the 2015 season, but he came back to place second in the $35,000 Suncast® 1.50m Championship Jumper Classic during week one and now picked up a win. Lamaze watched some of the early jump-off rounds and made his plan to do nine strides in one line where everyone else paced ten, but once in the ring, he did not need to leave out the stride. The rider spoke further about Check Picobello Z and the transformation that the gelding has made in the last couple of years, specifically coming back for jump-off rounds. With another win under his belt, Lamaze plans to bring out his big guns next week with another horse, Fine Lady 5. ‘Fine Lady’ was the rider’s mount for three out of his five Challenge Cup wins in the 2015 circuit and will contest the class in next week’s CSI 5* competition. In addition to the winning prize money, Lamaze picked up a $3,000 bonus for the third week in a row for wearing SSG ‘Digital’ style riding gloves as part of the SSG Gloves ‘Go Clean for the Green’ promotion. That brings his tally up to $9,000 in bonus money for the circuit so far. Also showing in the International Ring on Thursday, Darragh Kenny (IRL) and Kerry Anne LLC’s Glamour van de Kakebeek won the $8,000 Douglas Elliman 1.45m jump-off class. Emanuel Andrade was victorious in the $2,500 MAYBACH – ICONS OF LUXURY High Amateur-Owner Jumper speed class with Belita. The First Year Green Hunter division, which was presented by Equine Tack and Nutritionals, awarded Kelley Farmer and Like I Said championship honors on Thursday morning in the E. R. Mische Grand Hunter Field. Kelley Farmer and Tara Metzner had to stand out in a competitive field of 23 entries in an intense battle for the championship win. Having earned only a second-place finish over fences on Wednesday, Farmer needed wins in both jumping classes on Thursday to beat out Tara Metzner and Davlyn Farm’s Cy Young. Farmer succeeded, winning both over fences classes on Thursday. Farmer shined in the second over fences class, earning an impressive score of 98 and securing her championship victory by one point. Metzner and Cy Young settled for the reserve honors, after winning both over fences classes on Wednesday, placing fourth in an over fences class on Thursday, and earning a third in the under saddle. 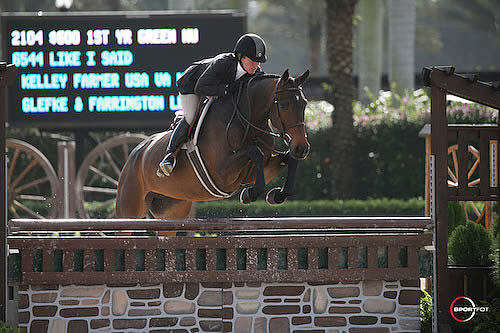 Like I Said is an eight-year-old Mecklenburg mare owned by David Glefke and Kent Farrington. The mare is a recent import from Europe, and this was Farmer’s inaugural show with her. The cancellation of professional hunter divisions due to rain prevented them from competing last week. “Wow,” was Farmer’s excited response to her impressive score of 98 today over fences. It was an unexpected honor that left Larry and Kelley visibly overjoyed. “This was her maiden voyage. She was great!” Farmer remarked. “She just does it so easily, and she jumps so careful and high. You never have to pick up the reins on her,” Farmer explained about what she believes makes this horse and her round today so special. “She goes so smooth and then gets high and crisp,” she added. “She is easy, brave, simple… she just wants to do it,” Farmer said. Like I Said also competed in the High Performance Hunter division on Wednesday, earning a second and a sixth over fences. “I think she can do a little bit of everything. I think she has it all,” Farmer noted about her future plans with the mare that she will continue to show throughout circuit in the First Years and the High Performance Hunters. The fourth week of competition at the 2016 Winter Equestrian Festival continues on Friday with a busy schedule on two sides of the Palm Beach International Equestrian Center. The $35,000 Illustrated Properties 1.45m Classic will be featured in the International Ring, and the Asheville Regional Airport Adult Amateur Hunter 36-49 Section A will award championship honors in the Rost Arena in the morning. The $25,000 Artisan Farms Under 25 Grand Prix Team Event, presented by the McNerney Family, will be held at The Stadium at PBIEC in the evening. For more information and full results, please visit www.pbiec.com.